Leigh has been with the firm since 1999. 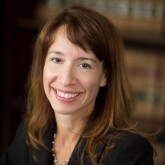 She attended Boston College and Boston College Law School, and has been a member of the Bar since 1991. Prior to joining the firm, Leigh was an Administrative Law Judge at the Massachusetts Department of Labor Relations and in-house counsel to the Alliance, AFSCME/SEIU Local 509. She is a partner at Sandulli Grace, P.C. Leigh represents the firm’s clients in all areas of labor law, including negotiations, arbitrations, disciplinary matters, internal affairs, unfair labor practice charges, court proceedings, injury cases and disability retirement applications, with a concentration in the representation of police officers with post-traumatic stress disorder. Like her fellow Sandulli Grace attorneys, Leigh has been involved in labor law education courses throughout her career. She is former Chair of the BBA’s Labor & Employment Section, and has been a member of both the MBA and the BBA’s Labor & Employment Section Councils. She has chaired and spoken at many educational seminars regarding public sector labor law, including the firm’s educational seminar for police officers, as well as educational programs for various client conferences, such as the Massachusetts Coalition of Police, AFL-CIO’s convention and the Massachusetts Teachers Association’s Williamstown Conference. She was a panelist at the Massachusetts Bar Association’s 2014 Labor & Employment Conference, and was a member of the faculty at Will Aitchison’s Labor Relations Information System seminar for public safety professionals in Las Vegas, Nevada in September 2014 and November 2015. Besides her advocacy and educational activities, Leigh is perhaps best known among colleagues for traveling across the country on a motorcycle in the summer of 1999. Her current hobbies include running, reading, and being with her husband and son. She lives in Arlington, Massachusetts.